Our microblading training is a 2-day long live event. No previous experience is required. Whether you are completely new to the industry, or a skilled artist looking to expand services and grow business, our intensive PhiBrows training is perfect for you. In just two days, you will speed through basics and accelerate towards advanced techniques. As you progress, you will have a sound grasp of the craft and start developing your skills. We welcome you to join us and journey into mastery of microblading! At Art of Beauty Academy, we take pride in providing all our students the highest quality of microblading classes available. That’s why our program follows the standards of the PhiAcademy – the global leader in microblading training. During your PhiBrows training you will also have the opportunity to practice on skin simulations, and then move on to live models. When practicing on live models, you will develop your skills by completing strokes drawn by your instructor. So don’t worry, there are no mistakes. The aim is to see how it feels working on real skin, handling equipment in real situations, putting the right amount of pressure and eliminating fear. Learn how to draw thin, crisp strokes that enhance the natural brow of your clients. Understand how to keep your tools safe before, during, and after sessions. Understand the mixing techniques required to match different colors of pigment. Learn to create your own eyebrow styles and customize them for different clients. All students of Art of Beauty Academy microblading classes will receive all the necessary instructions, tools and support to succeed in their classes and later work. Becoming a student of PhiBrows training USA, you will have access to Craft Master App by PhiBrows. You can download and register it to any device (smart phone, tablet, iPad) via email, text or call on Viber. Once you have completed the registration we will activate the app and give you access to all its features. Craft Master is the world’s number one microblading app. It includes a brow measuring tool, all lectures completed during the live course, 10+ hours of HD videos, 300+ photos, tutorials and guides, access to the microblading community and much more. After completing the live event you will receive a Certificate of Attendance. 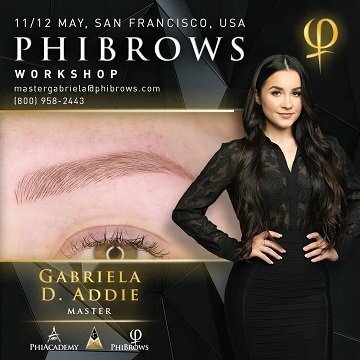 This will allow you to gain access to the global microblading network and get featured on the Official PhiBrows Website and the World Artist Map. Join our community and share your work and experiences. Let's inspire each other and be better artists each day! This payment option allows you to pay the training in full. The moment you complete the payment your balance will be $0.00 and you will be able to attend the training course. A deposit is only an initial payment. When you complete it, your remaining balance will be $2,900.00, plus a processing fee. The remaining balance will have to be payed one week before the start date of the class when paying with card, and on the day of the class when paying with cash. Start making more money! Microblading gives you the opportunity to start, expand and grow your business and make a weekly income of $4,000 and up to $208,000 per year. And that’s with minimal hours! 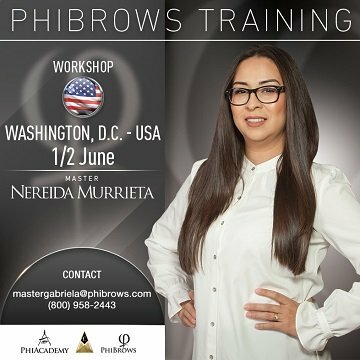 No need to purchase expensive machines or equipment - all you need is a premium PhiBrows Microblading Kit you receive at your training. Take advantage of Gabriela's PhiBrows training USA right now! At the Art of Beauty Academy you have the chance to learn everything about making microblading a succesful and high-income part of your business. If you are not able to attend a live microblading training, you can choose online microblading classes, as well.